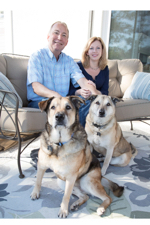 The story of Hilton Head Humane Association begins and ends with the story of the animals and their adoptive parents. 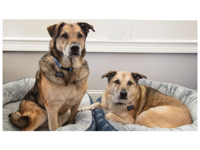 Meet Miller and Sparky—two nine-year old dogs that were orphaned when their lifelong owner passed away last July. The wonderful folks at Hilton Head Humane recognized the boys’ powerful bond and made the conscious decision to put them up for adoption as a package; they could not and would not be separated. But this would be no easy feat, because senior dogs can be difficult to place, although they make wonderful pets, and adopting a twofer is even more rare. Now let’s go back in time about four years, when Sara and Jim Ahneman moved to the Lowcountry from New Jersey. They came here with their beloved dog, Jax. Being animal lovers, they eventually crossed paths with Hilton Head Humane at a fundraising event and decided to make a connection online by liking their Facebook page. Miller and Sparky relax in their new home on comfy beds. Although the dogs’ story had thousands of likes and shares on Facebook, and they received many visits at the shelter, months passed without an adoption. But Sara and Jim fell in love with the dogs, and after searching their hearts and minds, they knew that it was meant to be that they would give the inseparable siblings a loving home. Miller and Sparky were adopted on New Year’s Day, 2017. Thanks to Hilton Head Humane and the Ahnemans, the boys can stay together, just like they have for all their nine years. But Sara and Jim speak as if they are the lucky ones. 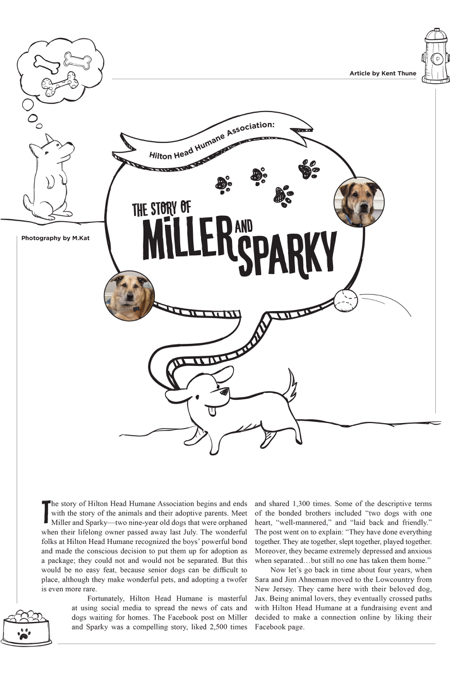 The story of Miller and Sparky is no different from thousands of other adoptions made at Hilton Head Humane. Some people have come from as far as California, Pennsylvania, Wyoming, and Virginia to adopt pets from Hilton Head Humane, all because of seeing a picture and a brief description of a cat or dog that needs a good home. But Hilton Head Humane does much more than just open the door to people wanting to adopt their next pet. “We sit down with prospective adopting parents and have a conversation with them. We also encourage people to bring in their current pets, if they have them. They can then spend time in one of two acquaintance yards on our campus. Our goal is to make a good behavioral match between pet and owner,” said Franny Gerthoffer, executive director of Hilton Head Humane. With as many as six million pets euthanized each year, it is crucial to remain proactive by decreasing the population of dogs and cats. The ultimate goal is to halt euthanasia of healthy, adoptable animals. Therefore, Hilton Head Humane is active in spaying and neutering dogs and cats in the Lowcountry. To maintain focus on another important part of their mission, Hilton Head Humane is active in preventing animal relinquishment. “When pet owners want to relinquish an animal, we can step in to find a way to keep that animal in the home. We can do this in the form of housing, financial aid, and behavioral management with our trainers,” said Laura Tipton, adoption facilitator at Hilton Head Humane. Over the past year, 3,000 abandoned, injured, abused animals and feral cats have been cared for by the Hilton Head Humane Association. Most of the organization’s time and energy is spent caring for the animals by providing food, shelter, medical attention, and love for these animals until adoptive homes are found. It is important to note that Hilton Head Humane is a “no-kill shelter.” No animal is ever euthanized unless absolutely necessary. This is how wonderful animals like Miller and Sparky, senior dogs that are often difficult to place, can stay in the shelter for weeks or months before finding the ideal home. This work could never be completed without outside help. The organization is funded entirely by membership dues, private donations, and generous bequests. How can you help Hilton Head Humane help the animals? Other than making a financial contribution in person or on their website, you can donate your time as a volunteer, assisting evacuation efforts during hurricane season, or helping with any number of outreach programs, fundraising projects, or other special events and needs around the shelter. Another way to help the animals in a meaningful way is to buy a memorial brick for a beloved pet or any loved one who has passed away. The bricks are $50 and are added to Hilton Head Humane’s brick courtyard for everyone to see. You can also give to the shelter by shopping at their thrift store, The Litter Box, which is located on Hilton Head Island at 46 Old Wild Horse Road, just 200 yards off Hwy. 278, between Spanish Wells/Wild Horse and Squire Pope Roads. In addition to finding and buying from the store, you can clear your closet, attic or garage of your unneeded stuff, drop it off at The Litter Box, and possibly qualify for a tax-deduction, all while helping the animals. You can also offer to help this charitable thrift store by working as a volunteer. The Hilton Head Humane Association is located at 10 Humane Way, Hilton Head Island. Adoption hours are 11 a.m.-4 p.m. You can reach them by phone at (843) 681-8686. For more information or to donate, visit online at hhhumane.org. And be sure to “like” their Facebook page so you can see and share with your friends more stories of pets that need homes!